It’s not easy to be a caregiver to a friend or loved one who has cancer. But your encouragement and involvement can make a real difference. One of the best ways to help is to be informed. 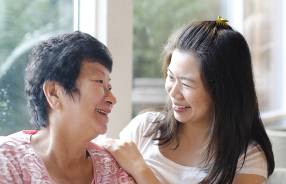 Making sure a person with cancer gets enough to eat is a common challenge for caregivers. Loss of appetite, fatigue, depression, and pain can all contribute to inadequate calorie and nutrient intake. To encourage your loved one to eat more, experts suggest reducing mealtime distractions and simplifying food presentation. These basic tips may help your friend or loved one maintain a healthy diet. This is just a start; if you have questions, follow up with your loved one’s healthcare professional.